The Fourth » Yes, there is STILL a princess in this webcomic! 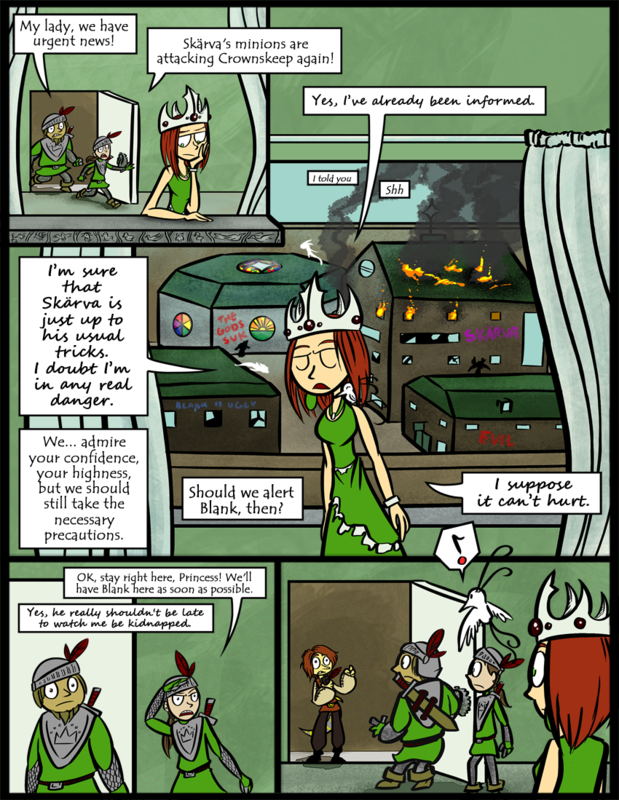 Yes, there is STILL a princess in this webcomic! In all honesty, though? It’s been like a YEAR since we’ve seen Veronika, and she really IS an important character. I’ve tried to signify that by displaying her on the banner. A little birdie told me (har har) that she might finally be getting more time to shine from here on out. That’s the problem with plans (besides devine intervention) is that no matter how perfect you plan it, SOMETHING always goes wrong. The princess was literally saying what skarva was hoping she’d think, but with what Blank talked with Derk I’m sure they’ll be expecting something different. Yeah, you’re definitely on to something. When I first thought of the idea for this story, I pictured it as more of a Mario parody, complete with the main character being some sort of hulking reptile. I do love Zelda, but I’m more of a platformer girl. It was Victor who really took it in the direction it went. Still, we get a lot of inspiration from Mario (particularly Paper Mario, which is really self-parodical) when it comes to certain things. Those guards did their job in record time! It must be pretty easy to be one of the princess’s personal guards. WHAT AN ESSDROPPER!!! That’s so rude! I didn’t think that heroes were so rude humph. Well they certainly aren’t getting any of MY business. (Insert gasp here) Captcha says agreenab police… It can see the soldiers uniforms…. O_o Captcha is scary sometimes. Thanks! Well, thanks to Victor. Well, at least you’re happy to see him. He’s going to need a self-esteem boost once he spots that blue graffiti. Oh wow! just noticed how you made her bedroom window a panel! That’s really cool! And the detail on it’s is really great! I wanted to get the point across that she really likes birds in general. Although she definitely has a favorite. She and i should be friends, I freakin love birds! …the graffiti just kills me. I just noticed that the guard on the left is the same one that was with the princess when we first saw her get kidnapped. will he be getting a name? captcha suggested Thomas ovicepu. i don’t think thomas would enjoy an office job though. I would absolutely hate to be her. Her life must be so dull, haha. Though I wouldn’t mind having the eavesdropping bird. I’m glad we’re getting more Veronika and I hope we see more of Blank as well. No matter what side the main characters are on, I’m always interested on what’s going on with the other team. Why do you think she has that face all the time? Well I mean, you could always tell her life was boring by the way she acted, but this is the first time I’ve ever really considered just how awful that would be. I just saw one of your adds on another comic! Also does she have a different dress? Yep, it’s been a while, but we’re advertising again! And yes, the other one was really annoying to draw. I figure if any character is allowed to change up their outfit, it’s the princess! Blank is shocked because he just saw that graffiti outside the Princess’ window; BLANK IS UGLY. He didn’t think that Skærva would stoop to such low personal attacks on him, in front of his crush after he worked so hard to get them together in his last plot! Wait, are those the same guards that let in Floyd and gang? Also, the feathers in their caps match the bird’s ! perfectly, might that be slightly important? I love that they have equal opportunity employment for the guards here. They even have sensible armor for the women! Not just a chainmail bikini! You do really good “third person” character profiles, like in the last panel. …Or maybe I just like them. Either way. Off topic: It would be great if the keys weren’t literal keys, but rather miscellaneous objects (swords, gems, ACCORDIONS *wink wink*) needed to open the portal or whatnot.